Hello my friends....Did you have the most wonderful weekend? Mine was terrific, thanks for asking! But it is time to get to work and today Penny Black has a new challenge in store for you. Yes, I know it says Colorful Christmas, but my new holiday stamps have not arrived, so I went with a Fall theme. I cut a "mask" with my Silhouette and inked the square on my card, then stamped Kisses in the Sun (Penny Black 4306L). 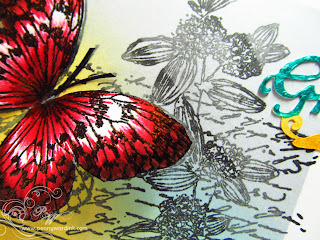 I stamped it a second time, colored the butterfly with Spectrum Noir markers, then fussy cut. If you know anything about me, you know that when I am at the cottage, I don't have a lot of crafting supplies, so the sentiment was cut with the Silhouette also. And because I am truly in love with my Liquid Pearls, no card of mine is complete without them. 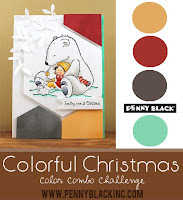 I hope you will get inky and submit your project for the Penny Black challenge. I am pretty sure prizes are involved! Love love love this! Beautiful use of the colors! That silhouette seems like a handy gadget!! Gorgeous card, Penny!! A lovely take on the colors, Penny! this is so gorgeous, penny... the butterfly is just stunning!